While Jacob Foreman, with Company E of the 28th Volunteer Infantry from Illinois was encamped at Pittsburgh Landing in Tennessee serving on picket lines, “The Gettysburg of the West” was just beginning. The Confederate Army started marching west out of Texas to the Santa Fe Trail. The purpose was to capture the Colorado gold fields and secure funding for the Rebel army as well as reach the California coast to control the ports and shipping. However, they only got as far as Glorieta Pass in northern New Mexico Territory. Colorado became a U.S. territory in 1861 shortly before the American Civil War began. 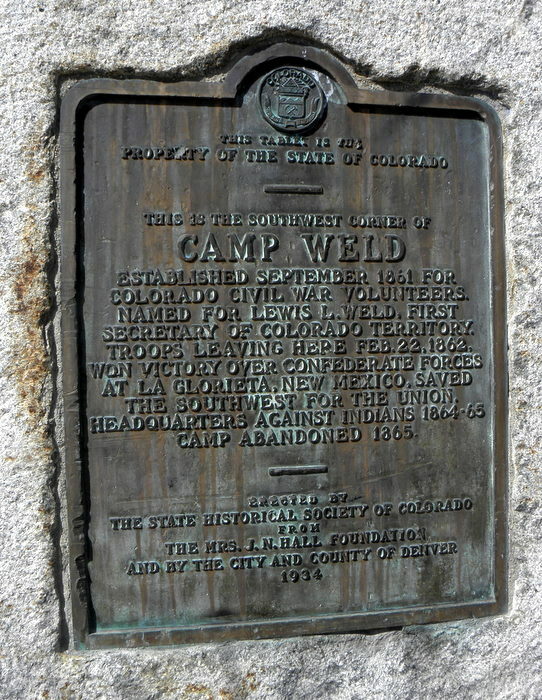 Organized at Camp Weld in Denver by the territory’s first governor, William Gilpin, the 1st Volunteer Infantry Regiment began enlistment for the union in August 1861. Nicknamed “Gilpin’s Pet Lambs” because of the governor’s involvement in their organization, the regiment marched to northern New Mexico in February-March 1862. There they fought in the battles of Apache Canyon and Pigeon’s Ranch (also called the Battle of Glorieta Pass) and at Peralta, New Mexico. Their first colonel was John P. Slough, who resigned and was replaced by Major John M. Chivington in April 1862. The regiment’s first and only lieutenant-colonel was Samuel F. Tappan. The Colorado State Archives has custody of the casualty records, clothing issue records, some of the muster rolls, and the morning reports relating to this regiment. 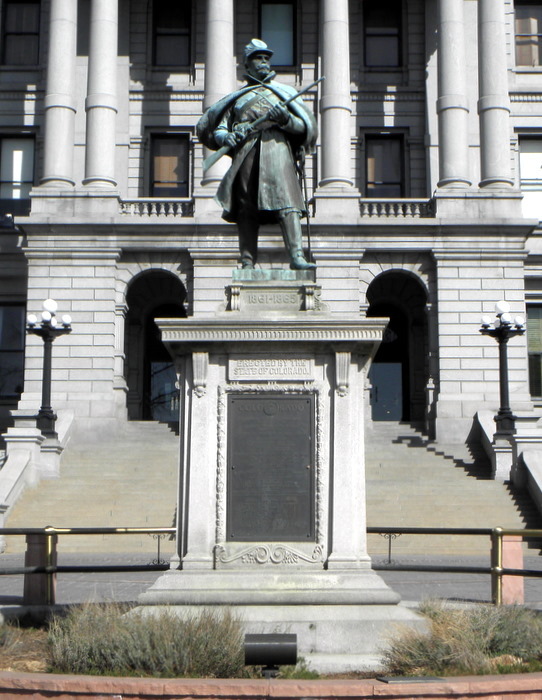 This bronze figure of a Union Soldier on the west side of the state capitol building facing south towards Glorieta Pass with gun in hand was built to honor Colorado’s Civil War heroes and to promote civic pride. It is the work of Captain John D. Howland, a prominent member of the 1st Colorado Cavalry and accomplished artist. Howland studied art in Europe and Mexico and also under the tutelage of Armand Dumeresq, who was secretary to the Indian Peace Commission. Howland was also a correspondent for Harper’s Weekly. While the monument was designed by Captain Howland, J. Otto Schweizer of Philadelphia actually molded the figure. The statue was unveiled on July 24, 1909 using donations from both the taxpayers as well as the Colorado Pioneer’s Association. The stone base of this monument is adorned with four tablets that list the battles and the names of the soldiers who died. Also chiseled into the base of this grand memorial is the proud statement that Colorado had the highest average of volunteers in the Civil War of any state or territory in the Union. Another plaque on the statue refers to the discovery of gold at Pikes Peak in 1858 by Green Russell and others. The plaque on the north face of the monument simply reads, ” For the Unknown Dead.” Originally two black walnut trees from the home of Abraham Lincoln flanked this memorial. While the trees no longer stand, there is a plaque within the capitol commemorating the generosity of President Lincoln for his donation to the beautification of our capitol. Camp Weld was located near the Platte River. This marker is located at the southwest corner at what is now Eighth Avenue and Vallejo. Several other markers still stand. I haven’t found them yet! This entry was posted in Family History and tagged 150th anniversary, 1862, Camp Weld, civil war, colorado, Colorado history, Denver, Glorieta Pass, history.